GREEN BAY — The upcoming four preseason games will focus a lot on evaluation of the roster, and part of that evaluation will be eliminating the mental mistakes that can plague players during the installation phase of training camp, Mike McCarthy said on Tuesday. The first roster reduction is not until after the third preseason game, but players will start making their claim to roster spots, or weeding themselves out, starting Thursday night at New England. He added that there are always players who play better in the games than they do in practice. With the first week-plus of practices focused on installing the playbook, some young players “catch their groove” later in camp and get a longer look from the coaches. “Maybe their consistency line will flatten out some and they’ll go out and play very well. It happens every year,” McCarthy said. “Some guys play better than you think they would. Some guys don’t play as good. 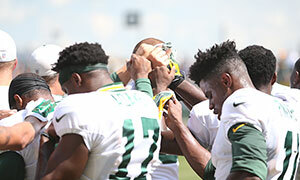 Game performance still ranks at the top, McCarthy added, but how a player fits in the locker room and how they are as a teammate also factor in. For a lot of players, especially the backup QBs, the games provide far more reps of competitive work than they get in any individual practice. As far as playing time for the starters on Thursday, McCarthy said that would be discussed after Tuesday’s practice. LB Clay Matthews’ return to practice on Monday went well, and McCarthy anticipated he would practice on Tuesday again.